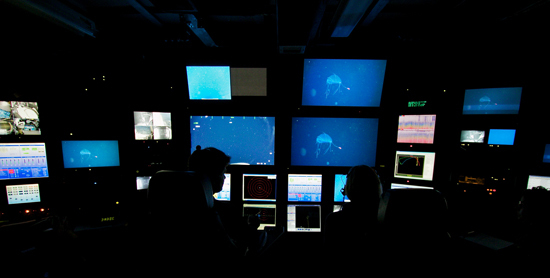 This video was taken by a submarine sent down into the ocean to collect deep sea animals. While you’re watching it, pretend you’re driving it remotely from a dark room that’s swaying back and forth, on a boat 600 meters above the submarine, and you’ve been watching marine snow fly by like stars for the last several hours. One of the perks of working with jellyfish is going to sea to collect them. The Dunn lab occasionally gets the chance to join our friends from the Haddock lab, at the Monterey Bay Aquarium Research Institute (MBARI), on a week-long excursion out into the Pacific Ocean. About nine scientists from different labs, about five submarine pilots, and a full boat crew leave from Moss Landing aboard the Western Flyer. Once we reach deep water, we stop driving and drop the submarine into the ocean. The submarine that lives on this boat is called Doc Ricketts. It is about 7 feet tall, has propellors, cameras, lights, collecting buckets, spatulas, and measuring instruments. 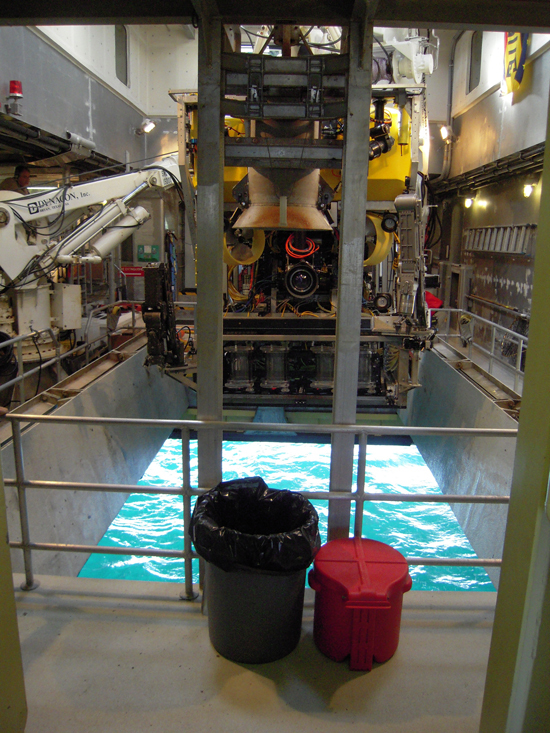 A crane lifts Doc Ricketts off the floor, the floor opens up to reveal the surface of the sea, and the machine is gently lowered into the water. This is not the type of submarine that people can travel in. Rather, it has a 2.5 mile umbilical connecting it to the boat, where the pilots are driving it around remotely from the control room, while watching a live, high-definition video feed of what the submarine is seeing. The control room is a dark little cave on the boat. If you are not driving, controlling the camera, or keeping records of the animals, you can sit in the back and watch the marine snow fly by on the screen as the boat rocks deeply back and forth. When someone spots a shadow that looks like an animal, they shout ‘stop!’ and the pilots drive closer to it. 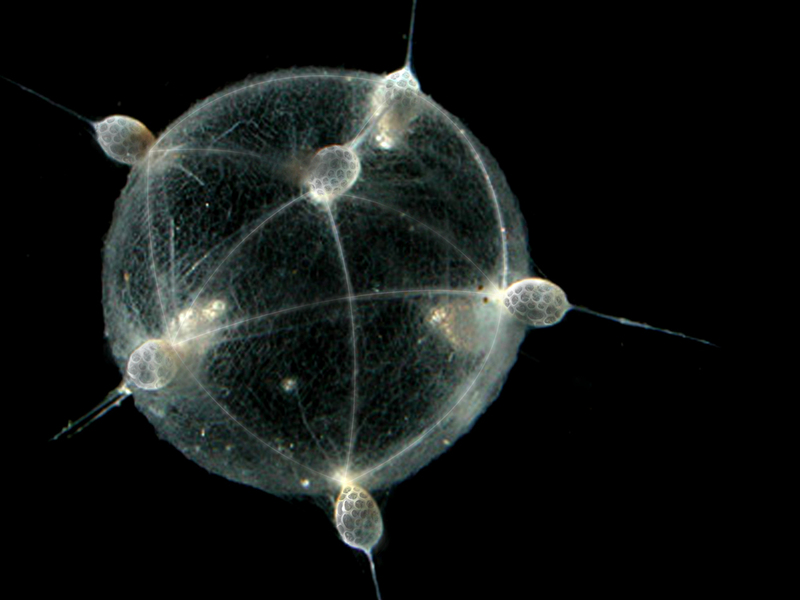 Sometimes it turns out to be a decaying blob of sea-lint, but with any luck it’s an intricate radiolarian, or an elusive vampire squid, or some other beautiful creature. After getting a couple of minutes of close-up footage, which is sometimes the only record of the animal as it exists in the wild, we will either collect it in one of the buckets on the submarine, or keep on flying. 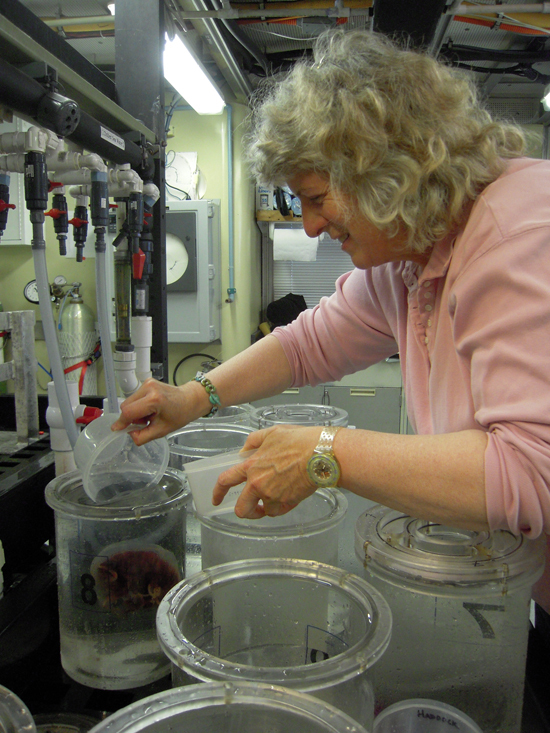 Some folks will put their animals in the lab’s walk-in refrigerator (with lids, so they don’t slosh out of their bowls with the rocking of the boat) to look at another day. 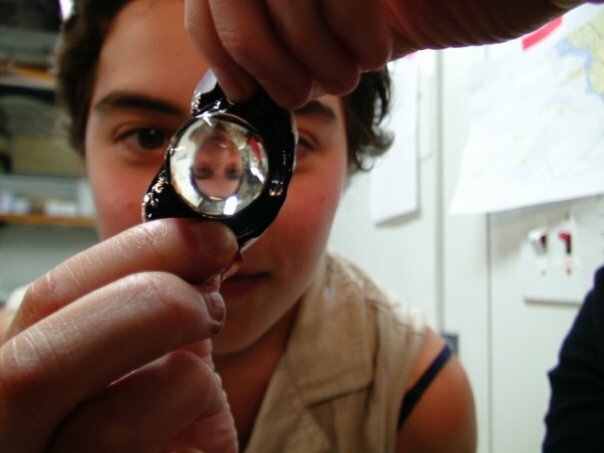 Some will stay up until the wee hours at their microscopes, processing the samples as quickly as they can while the boat speeds through the night to the next destination. 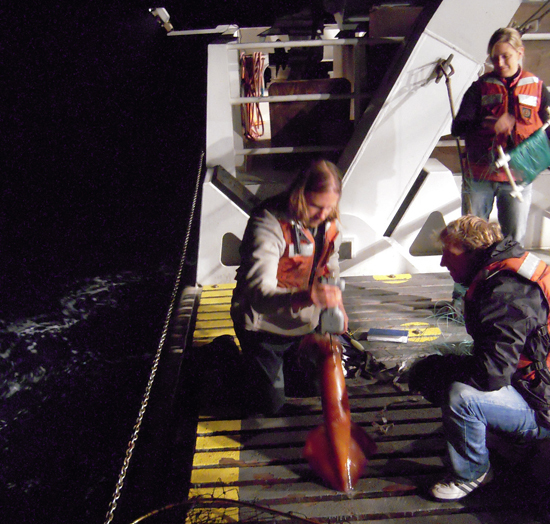 In this photograph, Dr. Claudia Mills is gently taking a Paraphyllina out of one of the sampling buckets (from a depth of 2360 meters), so she can draw it and take notes before sunrise, when the submarine will be lowered into the water again. All of these photographs were taken by Sophia Tintori during a research cruise last year, except the control room photograph, which was taken by Stefan Siebert on a cruise earlier this month. The video of the humbolt squid is also from this recent cruise and it provided graciously by the Monterey Bay Aquarium Research Institute. All photos are released under a Creative Commons Attribution-Noncommercial-Share Alike 3.0 license.